Every couple planning their wedding day should ask themselves this question. There is no right or wrong answer but here are a few things to consider. As a former sales manager at Marines' Memorial Club, when asked if I thought a couple should hire an independent planner in addition to what was provided, I answered NO 90% of the time. The other 10% would get a YES, because their vision was well outside of the package, or the couple wanted someone to help them secure the other outside vendors. 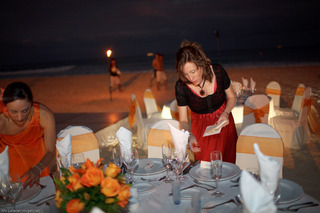 An onsite planner or catering manager have specific rules setup by the venue or company that they must follow. When hiring an independent planner, they answer directly to you, and not to some other boss. Having friends and family help out with planning your wedding is a great idea. Before you commit anyone to orchestrating your big day, I urge you to take a moment and think about who you would like to celebrate it with. Anyone you task to 'work' during your wedding day will have their focus on the that instead of showering you with love and attention. It's a much better choice to have someone outside of your group handle all the details the day of, so that you can have fun with your family and friends. Even the smallest event needs some structure to make it successful. It should however not feel forced, and a good planner will help you create a day that flows effortlessly. As a guest (and that includes the bride and groom) at an event you should never have to be concerned about time or what comes next. That's great! There are lots of online resources that can guide you in the process. I still recommend that you consult with a professional who is in tuned in with recent trends, have existing vendor connections and years of experience. At least, you will need to have someone manage the day of so that you can focus on being the bride and groom! This is your day and you don't want to miss it while running around dealing with last minute changes. To sum it up, I want to use an analogy. If your car breaks down you have the option of fixing it yourself or bringing it to a mechanic. Most of us have never worked on cars, so we take it to the shop to save us time, money and have an experienced mechanic fix it. Your wedding is one of the most important days of your life. Why not put it in the hands of someone who has the experience, who can save you time and money and help you create the day of your dreams! Pebbles & Water - So simple and with endless possibilities. Add some pebbles to your vase to stabilize your flowers or add different colored pebbles into a hurricane candle holder. Let an orchid float on or in water. Use a fun vase with a single stem orchid. Succulent Terrariums - Since I don't have a green thumb, succulents are my plants of choice. 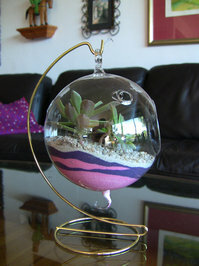 Make a terrarium and it's like a little mini-landscape inside an awesomly cool container of choice. An added bonus is that you can create these centerpieces well ahead of your event, not having to worry about them wilting. If you don't want to search for all the pieces yourself search on Etsy for DIY kits. I found this really awesome one from SucculentlyUrban that includes the container, plants, sand, gravel and instructions for only $25.00. I want one! Bonsai Tree - Having the pleasure of working with amazingly creative clients they often come up with fun ideas of their own! Here's one from last year from a couple who are very green conscious and loves everything trees. They hosted their wedding weekend surrounded by redwood trees, their ceremony was held in the redwood amphitheatre and included a tree planting, their favor was a tree seedling and as a centerpiece they had a bonsai tree. I was given one to care for, and I would use a picture of it for this post, if it wasn't for the previously mentioned lack of green thumb resulting in a sad looking bonsai tree on my desk. You're not the type to want to plan a traditional wedding, but can't come up with ideas to make it unique. Don't fret! Here are a few creative options designed to fit a tight budget! 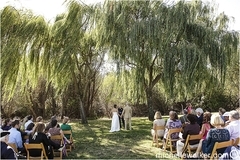 Host your wedding at a park instead of renting an expensive private venue! Local, state and federal parks are extraordinary wedding locations, providing your event with a setting worthy of a fairytale. Depending on the park and size of your group, you will most likely need to secure a permit. That sounds a lot scarier than what it is. It's usually not more than filling out a form and paying a fee. The specifics based on your location can often be found by a simple online search, or by calling your local parks & recreation office. The cost is seemingly low ($50 to a few hundred dollars) and in return, nature will provide you with and amazing backdrop for your special day! 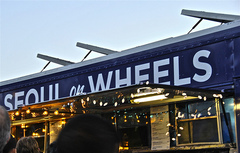 Food trucks are so in right now! 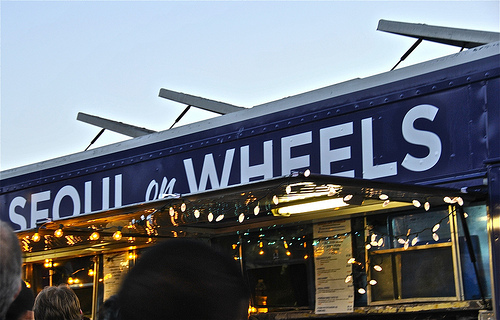 Hopefully, you've had the chance to enjoy some of the delectable creations coming out of a kitchen on wheels. Now, don't stop there! Did you know must food trucks can also cater your event, giving you the opportunity to host your guests a meal fit for a king without having to pay with your kingdom. To top it off, they can pretty much setup anywhere (say in a park) since food trucks are self contained. Cool huh! Ice Cream vs. Cake I'm just not that into cake, and I know I'm not the only one. I don't know why, but I've been like that since I was a little kid. 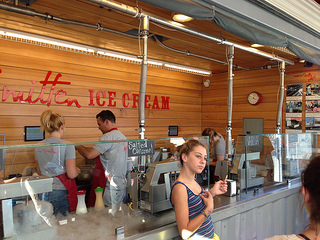 Ice cream on the other hand is a completely different story. Add some caramel or chocolate sauce, sprinkles or a cookie to it and I'm in heaven. Set it up as a self serve buffet with different toppings or hire an ice cream caterer like Smitten Ice Cream and your guests will go home telling everyone that your event was the best ever! This should get the creative juices flowing. Stay tuned for more to come! When I started In the Moment Events it was just something I did on the side for friends who needed a helping hand with their events. It was also a great backup plan for when we decided to have kids.I worked full time as an event planner at a venue, I could not fathom working my regular 10-12 hour days when the kids where really young. In 2010 we had our first child, and quickly thereafter a second and I ended my full time employment as planned. Keeping busy with a few events a year helped me stay connected with the industry and feel like a grown up. Last year my focus was finding a good balance between being a mom and an entrepreneur. At the end of 2012, I had a chance to flex my skills when assisting Robert Fountain Intl. with a few of their clients holiday events. Pulling 60+ work weeks (standard in the industry) I was reassured that not only was I ready to go full steam ahead, but so is my family. 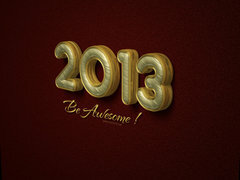 This year is designated to transforming my sweet 'on the side' gig into something much bigger. I have so much event planning experience locked away in my head that I'm finally ready to share, whether you are a couple planning their wedding day, business planning their product launches, trade shows seminars, you name it. This experience doesn't do anyone any good being stuck in my head so I pledge to you that I will post something new and exciting on my blog every day. It might just be a cool new venue I came across, or a service that I use or a great DIY project. Heck, being the food lover and home chef that I am, I might even share some of my favorite recipes.